Overall, the book is good. There’s plenty of great information in it. I picked up quite a few ideas about screening new products. Knapp covers all the key points from setting up the team, developing the idea, defining product features, prototyping the idea, and gathering customer feedback. It’s an impressive process given how much is covered with the expectation that you will complete the process in one week. It sounds far-fetched, but Knapp lays out each day showing how to do it. He even includes examples of teams he’s worked with that have done it. While I enjoyed the book and got a lot out of it, there was one key thing I struggled with applying it to my company. I don’t feel that the process is within reach for teams that are bootstrapping and/or those with limited resources. You need a team of at least 5-7 people that cover a range of disciplines to implement the process effectively. The amount of resources required would work well in a larger, established company environment, or in a well-funded startup. I was also a little concerned about the customer interview process outlined in the book. 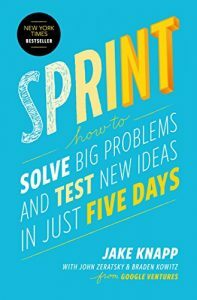 The interview is a key piece of the Sprint process. In order to be certain it is done effectively, I would recommend that the person(s) conducting the interview process have prior experience conducting the interviews, or get plenty of training and practice beforehand. Otherwise, I’m convinced the process works. I’m working to identify ways that pieces of the process can be implemented in our new product definition process. The idea generating and brainstorming sessions, the voting process, and the prototyping pieces can be performed without needing a full team of people. These alone will help me to improve our new product discovery process, and one day I hope that I’ll be able to implement all of the ideas and workflows that Knapp outlines in Sprint.